Whitening is the most popular cosmetic dental procedure. It can be a very effective way of lightening the natural colour of your teeth without removing any of the tooth surfaces. Or it may be an intrinsic stain caused by exposure to too much fluoride as a child while teeth are developing. Also Tetracycline antibiotics can stain a child’s teeth if taken by a mother during the second half of pregnancy or by a child who is 8 years old or younger. Dental trauma my darken teeth. Your dental team will be able to tell you if you are suitable for the treatment. The ‘active ingredient’ in the product is usually hydrogen peroxide or carbamide peroxide. As the active ingredient is broken down, oxygen gets into the enamel on the teeth and the tooth colour is made lighter. At Angel Smile we use Philips Zoom! the whitening system which is the most trusted and researched system and chosen by over 4 million patients worldwide already. The effects of whitening are thought to last up to three years. However, this will vary from person to person. The effect is less likely to last as long if you smoke, or eat or drink products that can stain your teeth. 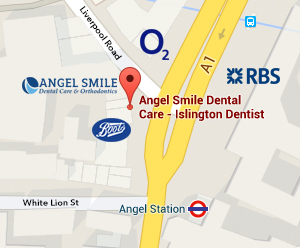 Ask your dental team at Angel Smile for advice before you start treatment.